Açıkçası, uğramanız ve çevrimiçi canlı seks sohbet odalarımızı ziyaret etmeniz için birçok büyük sebep var. Tabii ki, Bizimle sohbet odalarımızdan birinde olana kadar gerçekten ne kadar eğlenceli olacağını asla bilemezsiniz. Biz burada hoş geldiniz ve gerçekten sizinle bu yeni deneyimi paylaşmak için sabırsızlanıyoruz. 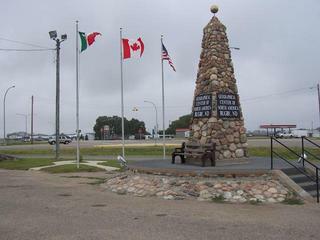 The Geographical Center of North America is located in Rugby, North Dakota - population 3,000. In January 1931 this location was established by the United States Geographical Survey. You can read how this was determined on the link below. The stone cairn beside Highway 2 was completed in August 1932 by W.B. Paterson and E.B. Paterson. Local Boy Scouts and other community volunteers assisted with the building and the local Lions Club donated the construction materials. In 1971 the cairn was moved to the present location when the highway was four laned. The coordinates on our GPS read N48° 21' 15.8" W99° 59' 53.1". If one looks at the North Dakota Government website you will find they state "The U.S. Geological Survey does not recognize the geographic center of North America (or that of the 50 States or the conterminous United States) as exact locations. The reason for this is that there is no generally accepted definition of a geographic center and no reliable way of determining it. Consequently there are probably as many geographic centers of a given area as there are definitions. Both Douglas (1930) and the U.S Geological Survey define the geographic center of an area as "…that point on which the surface of the area would balance if it were a plane of uniform thickness,…" This point of balance is the area's center of gravity. The U.S. Geological Survey's published coordinates for the geographic center of North America are based on this definition. Even so, it is clear that any attempt to determine the center of a landmass the size of the North American continent, with its variable and complex topography can only be an approximation at best. The calculation is further complicated by other factors including the curvature of the earth, the presence (or absence) of large bodies of water, and whether or not the term "North America" should include offshore islands. The "official" position (exclusive of islands) of the geographic center of North America at latitude 48° 10' North, 100° 10' West is thus no more than an approximation, and we can never reasonably expect it to be any more than that. And on a continent where extreme distances are measured in thousands of miles a sixteen-mile discrepancy is miniscule. So Rugby deserves to keep its monument. It is an intriguing tourist attraction and far more accessible than the muddy bottom of a slough!" We have driven past this landmark many times, even as children traveling with our parents, but this is the first time we have documented it. Last year we showed a photograph of it in our visit to The International Peace Gardens near 49°N 100°W, 72 km to the north on the Canadian/American border. Many people have passed this landmark as they drove the western section of historic Highway 2 which stretches from Everett Washington on Puget Sound to St. Ignace on the Straits of Mackinac in Michigan. On the Rugby, ND brochure is the greeting, "Welcome to the Center of it All!" This farming area offers hunting, fishing and birding opportunities. There is a Victorian Dress Museum, a Historical Amtrak Train Depot with daily service, and the Prairie Village Museum with a Northern Lights Monument. The multicolored beams are lit by high intensity lights that simulate the Northern Lights. Read more about Rugby, and the Geographical Center of North America. #1: Geographical Center of North America in Rugby, ND with the flags of Mexico, Canada and the USA. #2: View of the cairn looking East along Highway 2 and the service road. #3: Mileposts pointing South and North. #4: Mileposts pointing West and East. #5: The view South along Highway 3 showing a field of sunflowers in the distance. #6: Looking South from Highway 2 near Rugby. #7: A lone cyclist pedaling towards the center of North America. #8: A view North from Highway 2 near Rugby. Note the distant train travelling East.